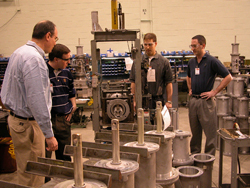 Engineering Career Development offers companies many opportunities and programs to recruit engineering students. If you are looking for co-op, intern, or entry-level, full-time candidates, we can work with you to schedule an event or develop a custom recruiting plan to meet your needs. Explore the links below or contact Allison Berger at 847-491-2613 to get started. For all Engineering and Technology students and employers. SWE Industry Day Career Fair takes place in October each year. Click here to see dates. McCormick Interview Day is held the day after SWE for employers who want to interview students on-campus after the Career Fair. Tech Expo is held each year in January. Click here to see dates. McCormick Interview Day is held the day after Tech Expo for employers who want to interview students on-campus after the Career Fair. Just-in-Time Career Fair is held in April. Click here to see dates. Engineering Career Development uses a secure online database management system called McCormickConnect to connect employers and students for co-op, internship, and full-time positions. View and register for our upcoming Career Exploration Day events by clicking on the Career Events tab in McCormickConnect. This event cost $150 to attend for employers. Included are a high top table with two chairs, parking, and lunch. Join us and help our students prepare for the SWE Industry Day Engineering Career Fair! Review resumes at our "Resume Round-up"
Conduct mock interviews at our "Mock Mash-up"
Let students ask you questions about anything (almost), fielding questions about the application process, tips on a successful interview, etc. We also have a "Photo Booth Bonanza" where students (and our industry guests) can get an updated LinkedIn photo taken. Students from all disciplines will be invited to attend, including chemistry and physics. Contact Allison Berger, Manager, Employer Relations at 847-491-2613 to schedule your on-campus recruiting event. You can also see a calendar of our major recruiting events on the Recruiting Events Calendar. Contact Allison Berger, Manager of Employer Relations, at 847-491-2613 to start planning your recruitment strategy. To arrange a date to interview students on or off-campus, contact Michelle Bledsoe, Recruitment Coordinator, at 847-491-5994. To optimize your travel, you can coordinate your interviewing schedule with any of our career fairs or register for McCormick Interview Days. Please take our student academic calendar into account when planning. For offers of full time employment extended to summer interns, offers should remain open until November 5. For all other formal offers of employment (intern or full time), offers should be open for a period of three weeks. Occasionally, an employer’s hiring timeline may fall outside of these preferred windows, and/or a student may ask for an extension or exception to these dates. Once you accept a job offer, whether via On-Campus Recruiting or in an independent job search, it is the expectation that students will decline other interview invitations and stop applying for other opportunities. Reneging on an offer is unprofessional behavior that negatively impacts the student's reputation and that of Northwestern University, our alumni, and current students.